After you have Added A Client and Created A Service, you are ready to schedule an event in Time To Pet! There is one item to keep in mind when scheduling services in Time To Pet. First - all scheduling is intrinsically linked to invoicing. That means whenever you are scheduling events for your client, you are also creating the invoice for them at the same time. Here is our help article on Understanding Invoicing on Time To Pet if you would like to learn more about how this works. Let's get started! After clicking Schedule Client, Time To Pet will ask you to select which client these services are for. Select the client whom you would like to schedule an event for. If your client has any open invoices, Time To Pet will ask if you want to create a new invoice or if you want to add these events onto an existing invoice. If your client does not have any open invoices, then you will not see this screen and can skip this step. From here, you can select the date and time of the visit, select the service, select the staff, which pets you will be providing services for, set the status of the event, and add any notes. 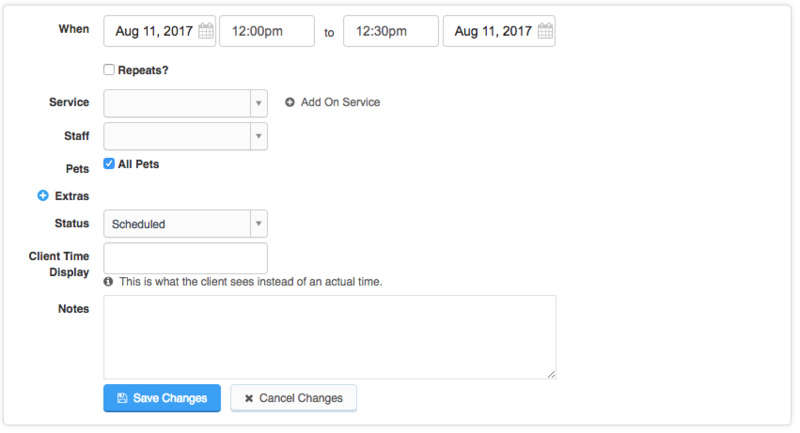 Expert Tip - You can also schedule events by following these steps and clicking on the calendar in the time slot you need instead of clicking "Add New Services". You can also schedule multiple events at once by using the Schedule A Trip tool.